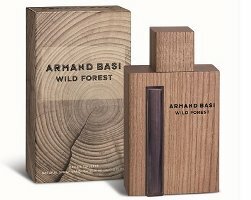 Spanish designer Armand Basi has launched Wild Forest, a new fragrance for men. Wild Forest was developed by perfumer Nathalie Lorson; notes for the spicy woods scent include pepper, nutmeg, violet leaf, cedar, vanilla, leather, incense, patchouli, amber and white musk. Armand Basi Wild Forest is available in 50 and 90 ml Eau de Toilette. OMG! I love that bottle! I wonder if it’s a real wood on the outside. Yeah, me too. If it’s not wood, forget it. Ya, if not wood, forget it. I hope not too much vanilla is used in it. The notes sound promising enough. Yep. Don’t see this brand around though. Yeah, it’s the same everywhere! You’ve smelled it already then — good to know!